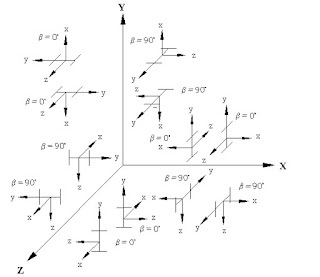 Civil Engineering: What is Beta Angle in Staadpro? 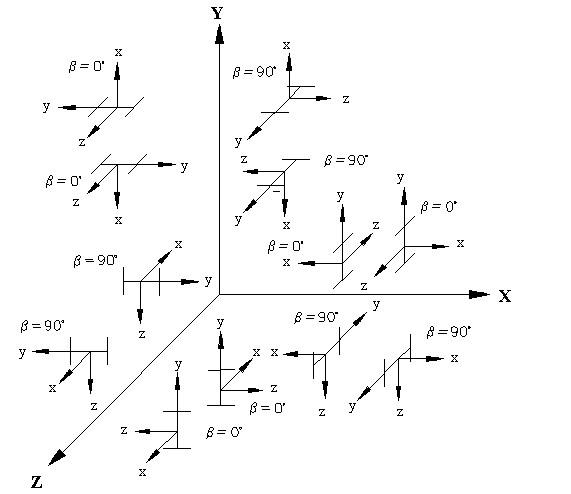 When the local x-axis is parallel to the global Vertical axis, as in the case of a column in a structure, the beta angle is the angle through which the local z-axis (or local Y for SET Z UP) has been rotated about the local x-axis from a position of being parallel and in the same positive direction of the global Z-axis (global Y axis for SET Z UP). When the local x-axis is not parallel to the global Vertical axis, the beta angle is the angle through which the local coordinate system has been rotated about the local x-axis from a position of having the local z-axis (or local Y for SET Z UP) parallel to the global X-Z plane (or global X-Y plane for SET Z UP)and the local y-axis (or local z for SET Z UP) in the same positive direction as the global vertical axis. Figure details the positions for beta equals 0 degrees or 90 degrees. When providing member loads in the local member axis, it is helpful to refer to this figure for a quick determination of the local axis system.